One of the top male barbershop choruses in the country will perform in concert with special guests on Saturday evening. The youngest member of Knights of Harmony is just 11, and the founder of the chorus is still singing over 40 years later. The 45 performers are part of the Chess Valley Barbershop Singers with members from a wide range of backgrounds from dentist to HGV driver, from chiropractor to captain in the Royal Fleet Auxiliary, from builder to former bass guitarist in a Sixties pop group. And they come from miles around including Hemel Hempstead, Berkhamsted and Tring, writes Heather Jan Brunt. The concert at 7.30pm on Saturday (April 8) will be held at The Centenary Theatre in Kings Road, Berkhamsted and tickets can be bought in advance or on the door on the night. John Wiggins founded what is now known as Knights of Harmony in 1975. A retired project manager for British Telecom, at 82 he remains one of the Knights’ most active members and as well as having a fine tenor voice he is a talented arranger of barbershop songs. He was a lover of vocal harmony groups from a young age but formed the club in 1975 after attending a concert that featured a visiting American barbershop chorus. He joined a group in Reading but the travelling became too much and he decided to form his own club. 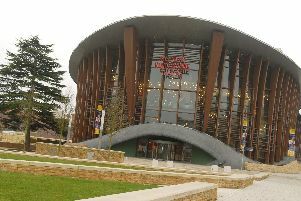 Over the years it has had different names and has been based in both Hemel Hempstead and in Chesham. He said: “Our club’s official name is the Chess Valley Barbershop Singers and its chorus is called the Knights of Harmony. Currently ranked 11th in the UK the Knights aim to break into the Top Ten this year when they compete in a national competition. Members sing unaccompanied songs ranging from traditional to pop and musical theatre classics. Their repertoire includes Stevie Wonder’s For Once in My Life, Diana Ross’s When You tell Me That You Love Me, Westlife’s You Raise Me Up and from Les Miserables, Do You Hear The People Sing. The youngest member is 11-year-old Zach Lines who is the third generation of his family to sing with the chorus. His father Al is the Knights’ chairman and joined the chorus in 1986. Grandad Stuart joined in 1975 and is membership secretary of the British Association of Barbershop Singers. Zach plays violin and piano and loves computer games and coding. And his goal is to win a medal at the barbershop annual convention. Guests at the concert on Saturday include Amersham A Cappella,barbershop quartet Midnight Four and solo singer Charlotte Yeoman. Tickets £15, under 18s £6 available from 07768 250522, kohtickets@spring-uk.net or on the door on the night.